Enrich your diet for weight loss with mung bean sprouts for vitamin B2, vitamin C, dietary fiber, and isoflavone to give you the little extra you need to get slim. Mung bean sprouts ("Moyashi") is one of the foods as great sources of vitamin B2 that helps you burn fat increasing your metabolism that you don't want to miss out on when on a diet for weight loss. What you will find in Moyashi is not only dietary fiber helping you prevent constipation but also isoflavone to boost your estrogen levels. What you take out of the mung bean sprout diet is not only the fact that they are very low calorie but also cheap making dieting to lose weight more affordable. Used in many different Japanese and other Asian dishes you will have a hard time not finding a way to use them in your cooking. Although inexpensive, mung bean sprouts provide a wide variety of essential nutrition including dietary fiber, vitamin B2 to relieve constipation and help you get more beautiful skin that all can be looked forward to on the mung bean sprout diet. In this next Slism, we will go over the mung bean sprout diet giving your tips on how to add more Moyashi into your diet adding new flavor to your meals with little effort needed. One diet that never left the door in the same way as the morning banana diet had is the Moyashi-mayo diet where you eat mung bean sprouts with a touch of mayo once per day. There are tons of ways to go about the mung bean sprout diet to help you lose weight, but the simplest one has got to be eating with less than a tablespoon of mayonnaise. However, because mayo is generally high calorie people who worry about they're calorie consumption can use reduced fat mayonnaise with mung bean sprouts. In addition, you may want to try the low calorie alternative of using either lemon juice or vinegar adding flavor without unwanted high calories. 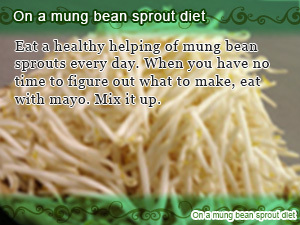 Mung bean sprouts are not only cheap and low calories but make you full, just what you need to help prevent overeating. Look up calories in Mung Bean Sprouts with Calorie Slism. Bean sprouts are one vegetable that you can eat to get you daily dietary fiber to help get you smooth bowel movements eliminating stubborn constipation before it ruins your diet. In addition mung bean sprouts is a good source of vitamin B2 to help you burn fat boosting your metabolism. Mung beans sprouts are high in vitamin C. While dietary fiber cleanup your digestive tract, the nutrient absorption of vitamin C in your body increases helping to prevent acne, noticeable blemishes on your skin, and pimples getting rid of common skin related problems. 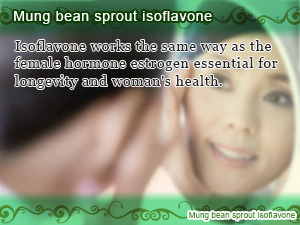 Isoflavone found in mung bean sprouts has the same effect on your body as the female hormone estrogen. Regular doses of isoflavone is said to prevent breast cancer and other conditions specific to women such as menopause disorder and osteoporosis. In addition, isoflavone in your diet is considered to be one of the reasons why Japanese people live so long. If you are looking to lower you cholesterol level, whiten you skin, and even increase your bust size getting enough isoflavone in your diet is a definite must. Mung bean sprouts are easily damaged, which means you want to eat them the same day you buy them. If you have leftovers plat in salt water to prevent the color from changing. In addition, just by placing in water mung bean sprouts can be kept fresh. In that case there will be a need to change the water that you are using to preserve your bean sprouts. You will know when you bean sprouts have gone bad when the surface of the water looks sticky. Prevent that from happening by changing the water. When eating mung bean sprouts, eat the whole thing including beans and the little whiskers coming off the beans sprouts that contain vitamin C, vitamin B2 and dietary fiber. Case and point you can never be too good to eat mung beans and whiskers even when all you are there for is the mung bean sprouts. When trying to preserve the freshness of mung bean sprouts vacuum packing them is recommended. This helps prevent mung bean sprout vitamin C content from being leaked into the water being used to preserve them. What’s so special about the black bean diet? Black soybeans known as Kuromame in Japan are a health food with many benefits not limited to just weight loss. Do you know that mushrooms can help detox your body? Just 200g of mushrooms a day. Chitosan in mushrooms can help your destroy unwanted fat from your body. Constipation, dry skin, and an irregular period or not the only weight loss problems for women making it so hard to lose weight to say the very least. What’s your apple diet? Is it the 3 day apple diet or the cleanse diet… fad diets are all like that, but maybe this time things will be different. Amazing apple health benefits. 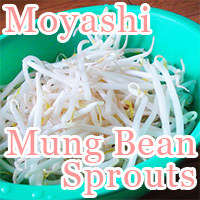 Eat a healthy helping of mung bean sprouts every day. When you have no time to figure out what to make, eat with mayo. Mix it up. 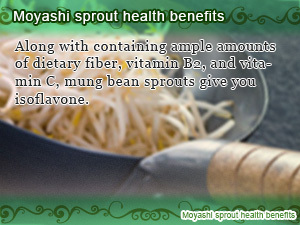 Along with containing ample amounts of dietary fiber, vitamin B2, and vitamin C, mung bean sprouts give you isoflavone. Isoflavone works the same way as the female hormone estrogen essential for longevity and woman's health.